적석총이란 고구려 초기부터 나타난 고구려 계통의 무덤으로서 돌무지무덤이라고도 한다. 석촌동 무덤들은 백제 초기에 만들어진 무덤으로서 일제 때 처음 조사되었다. 1호, 2호 무덤은 주민들이 농사 짓는 땅으로 이용해서 내부구조와 유물은 정확히 알 수 없었으며, 3호 무덤은 기원전·후부터 나타나는 고구려 무덤 형식인 기단식돌무지무덤(기단식적석총)이다. 무덤은 높은 지형을 평평하게 하고 밑 테두리에는 매우 크고 긴 돌을 두르고 자연석으로 층단을 이루면서 쌓아올려 3단으로 되었는데, 옛 고구려 지역인 만주 통구에 있는 장군총보다 큰 것임이 밝혀졌다. 5호 무덤은 조사가 완전하게 되지 않아 구조와 유물에 대해서는 확실히 알 수 없으며, 무덤 주변에는 무덤을 두르고 있는 돌을 2단으로 쌓았다. 내부구조에 대해서 확실히 알 수는 없고, 이 지역 지배계층의 무덤으로서 주변에 만들어진 무덤의 주인보다는 낮은 계층의 사람들 같고, 독무덤(옹관묘)이나 작은 돌방무덤(석실묘)에 묻힌 사람들 보다는 조금 높은 신분계층의 사람들의 무덤으로 볼 수 있다. 이 무덤들은 가락동·방이동 무덤과 함께 초기 백제의 문화와 역사를 알려주는 중요한 자료이다. 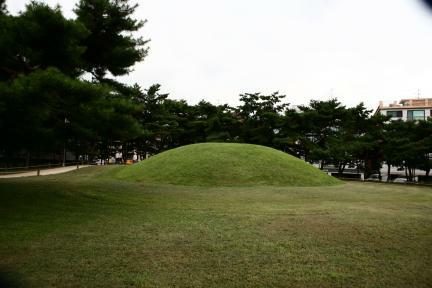 The traditional Goguryeo tomb called Jeokseokchong (stone mound tomb) first appeared in the early days of Goguryeo. 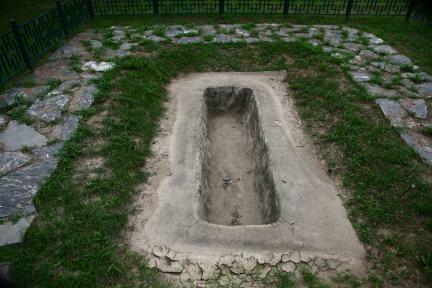 To make this kind of tomb, flat square stones are firstly laid down on the ground. Then a wooden coffin is placed on top of the stones, and finally the coffin is once again covered up with stones. 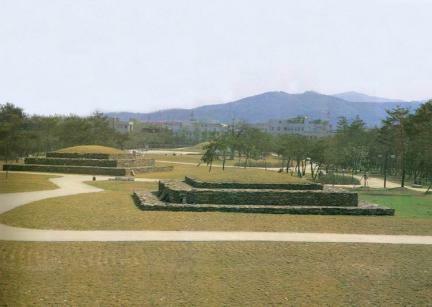 The ancient tombs of Seokchon-dong come down from the early years of Baekje. They were first investigated during the Japanese occupation. At the time of their discovery the plot of ground where the two tombs, tomb no. 1 and no. 2, stood was used by local inhabitants as farming land, so it was not possible to discern with certainty what were the inner structures and relics of the tomb. Tomb no. 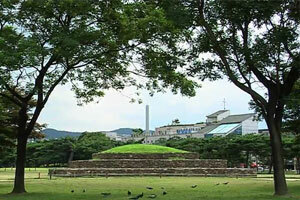 3 is a stepped stone mound tomb. This form made its first appearance around the transitional period between B.C. and A.D. To make it, a quite high piece of ground is leveled down, and the edges are framed around with big, long stones. The stones are heaped up in such a way that the tomb is storied, or layered. Tomb no. 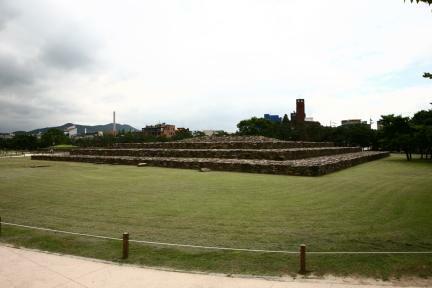 3 is a three-story tomb. 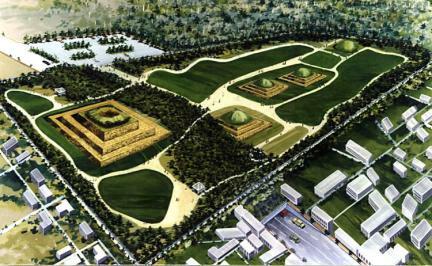 It is acknowledged to be larger than Janggunchong (Tomb of the General), located in Tonggu, Manchuria, the territory of ancient Goguryeo and present-day China. 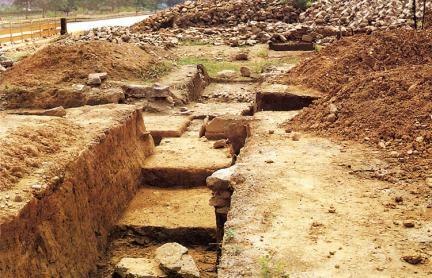 Due to incomplete investigation, the inner structure of tomb no. 5 and its relics remain obscure to a certain degree. However, it appears to have been a family burial place. 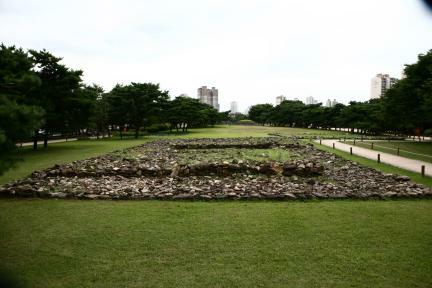 Stones with similar composition to those used to build the tomb can be found around the burial ground. Tomb no. 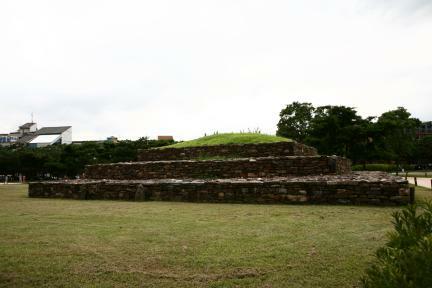 5 is a two-story tomb made with large stones. Nothing certain is known about the interior, but it is possible to infer that these were family tombs of the local governing class. Their social status seems to be below that of the people buried in large tombs nearby, and above that of the people buried in the jar coffin tomb, or small stone chamber tomb. 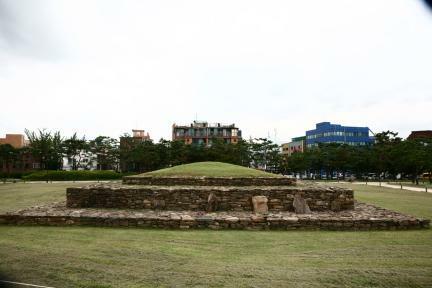 Along with the tombs in Garak-dong and Bangi-dong, these tombs disclose something of the culture and history of early Baekje, and so are highly valued.